On Saturday, I wrote (read more here) about SPG promotion called “Unlock Your Rewards” that was targeted for SPG American Express cardholders in the United States. It was unclear at the time what the promo dates were because I was unable to register for the offer. I can now confirm that this offer is valid for stays between September 15 – December 15, 2017. You can access and try your luck registering for this offer here. I would assume that this is just one version of the Select Member Exclusive promotion that I wrote about here because it is valid for exactly the same dates. There is another one out too that is valid for September 1 – December 31, 2017 (read more here). It is is interesting that SPG has been marketing same promotion under various messages from Select Member Exclusive to this SPG Amex. Well. 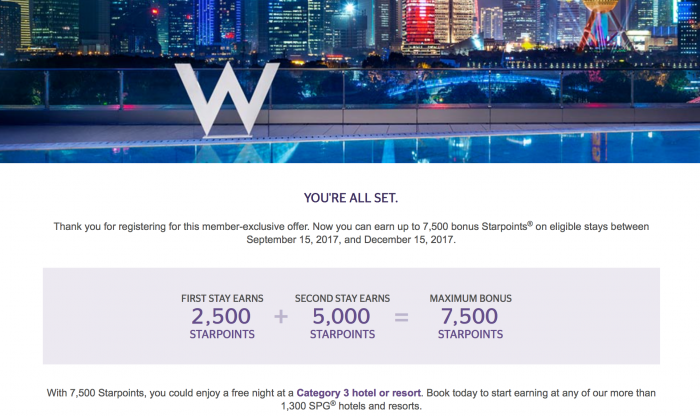 I don’t mind as long as they keep bonus Starpoints promotions coming our way!